The most effective stratedy for improving household energy efficiency is to first target your home's envelope—walls, attic, windows and doors. If your house has no wall insulation, and it has more-or-less continuous wall cavities, it can improve enough energy to be very cost effective. If your windows are leaky, it may be time to replace them with energy-efficient models with weatherstripping and storm windows. If your house is older with relatively poor insulation and windows, good landscaping can save energy, especially if planted on the house's west side. For houses with boilers and hot water heat distribution (radiators, baseboard), the savings from a modern condensing boiler with outdoor reset. First, turn down the temperature of your water heater to the warm setting (120F). Second, insulate your hot water lines so they don't cool off as quickly between uses. CFLs can save 3 quarters of the electricity used by incandescents. Electricity to run a light bulb costs much more than the bulb itself. Avoice the temptation to use the old fridge as a backup for party supples and liquid refreshments. The extra storage space will cost you about $15-$150. 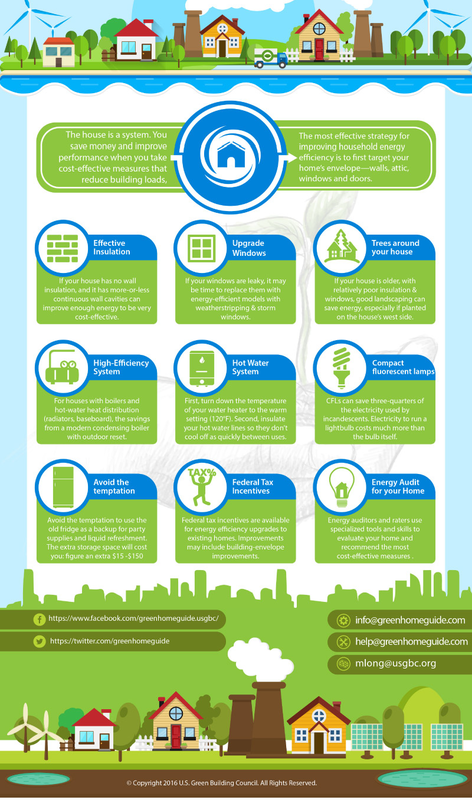 Federal tax incentives are available for energy efficiency upgrades to existing homes. Improvments may include building-envelope improvements. Energy auditors and raters use specialized tools and skills to evaluate you home and recommend the most cost-effective measures.